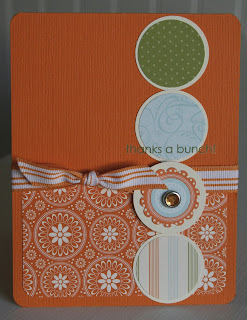 For this card I used part of what is left from my Boho Blend Simply Scrappin' kit. I made this card super quick. If you look close you can see the rub on greeting. That is also a piece left from the colored SAB rub on set. Lately I have not been adding glitter as I seem to be in a button or bling kind of mood. Bring on the buttons or the bling!! !